Tech Readers » Jazz Launches SMS Khazana 5 With the Gleam of Gold! 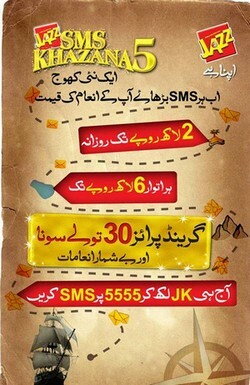 April 24, 2019 3:22 am You are here:Home Telecom Cellular Mobilink Jazz Launches SMS Khazana 5 With the Gleam of Gold! Lahore: February 15th, 2011:- Last year’s most popular trivia based contest launched by Mobilink Jazz was loved and enjoyed by all for the very fact that it made so many people win valuable cash prizes on a daily and weekly basis and ending up each time with an amazing grand prize. After successfully completing 4 rounds, SMS Khazana has now entered its 5th round and like every time there is something new in this contest for Mobilink customers. Once again, Jazz introduces its valued customers to another exciting quest of SMS Khazana whereby users can win lots of exciting cash prizes through lucky draw. Furthermore, to top it all, in SMS Khazana 5, one lucky winner will take away the grand prize of 30 Tolas Gold! Jazz SMS Khazana 5 will be unique in terms of its playability and there will be many surprise prizes for users throughout the campaign. In this round, users will be able to raise the value of the specific prize they are playing for by sending in maximum entries. Each correct entry will raise the value of the daily prize by Rs. 10,000/- while the Sunday prize value will be raised by Rs. 30,000/- with each correct answer. And user’s need not worry about incorrect answers, as even incorrect entries will raise the value of the prize by Rs. 5,000/- both for the daily and Sunday prizes! Send “JK” to 5555 to enter the contest. The participant will receive a welcome SMS along with a Ringtone (Ringtone will be sent within 24 hours). The quiz mechanism consists of multiple choice questions which participants would answer in order to raise the value of the prize money of that specific day’s prize, and increase their possibilities to become a winner. The participant will have to choose from option 1 or 2 to reply to a question. In addition to this, all of these points will be accumulated for consideration to win the Grand Prize at the end of the SMS Khazana 5 contest. The participant will send the answer he/she believes is the correct one in order to raise the prize value. Once answered, user will be notified via SMS whether the answer was correct or incorrect. In case the user does not respond with option 1 or 2 or sends any other text/number, he /she will get a reply message stating the option to be invalid. 11 Responses to "Jazz Launches SMS Khazana 5 With the Gleam of Gold!" yet again mobilink cha gaya hai with a sumthing fun! i love how they keep giving rewards! Yes, shiza, they do keep giving cash prizes away! but i haven’t won yet.. I hope i can win this round! Fingers crossed! got to try my luck this time!! this one looks easier..
same here..i have yet to win something but i saw a post somewhere saying they were giving out trips to the world cup as a prize too! Mobilink is on a roll here! Ya true, Mobilink is on a roll here! Check this contest out toO! Sms Khazana 4 Mein Bhi Hassa Lia jis mein Meray points 55000 k Lag Bag Thay Magar Kuch nein Milla ab Sms Khazana 5 Five Meray Ajj Tak 123000 Points hein Magar Kuch Hasil hein Ho raha hai. mein App Sub Say Request Hai k is tarha K Dokey Mein Mat Aaao is baat ki mein Nay PTA ko Bhi email Ki Thi Magar Koi Jawab Nein Mellay. 1. Kindly give your comments on the issues highlighted by the complainant. Compliance report on the matter shall be forwarded to this office by 23 April 2010 please. 2. Copy of all correspondence/ status reports related to the enclosed complaint shall be communicated simultaneously to the complainant and this office by the stipulated date please. An expeditious and logical redressal of the consumer grievance at your end shall be appreciated. I have following complains about the scheme. 1. The first biggest complain about this scheme is that Quarndazi was not transparent. They must have to involve the third party for creditability of scheme or do on the media at least. 2. The rules & regulation of scheme was not briefed clearly at the initial stage and nobody knows when the scheme will be ended and how they evaluated the customer’s performance. 3. The One SMS Cost is RS 9.54 which was very high for ten points. But I received 65825 points in this scheme. What can i do with these points because the Qurandazi was not transparent and showed on the media? 4. Now the mobilink company helpline are misbehaving and abusing me. Please check my call records. 5. In this scheme many customers have lost their money on baseless and fraud scheme. Kindly take immediate action and confirm me too. Otherwise the interest and faith of people will be gone from the PTA and MObilink. I feel Jaz SMS Khazana is totaly for generating money, in other words it is totaly fraud. I am thinking not only file a case against Mobilink/Jaz and I am trying to contact with Media. I have noted almost three times they have cut our points (in otherwords points kha jatey hain). there is no check & balance or to contact any high official to registered a complaint. they have just only lower staff to rectify the complaint on phone. But I am not satisfy with there response. because complainent should must present in there office face by face. I am playing fastly and I have got 193700 points but 7000 points not calculated in my points not only one time it happened almost three times. So I stop playing. i have been plying sms khazana 5 game fo about last two months through mobile no:030092***** and have gained 2898410 points up to 11-5-2011but nothing is shown as win by me in socalled luckydraw as yet.i therefore suspect thatt something is wrongly plaed with innocent public while pplying fabricated method.